The final round of the Pro-Assistant Championship concluded today at Tualatin CC. 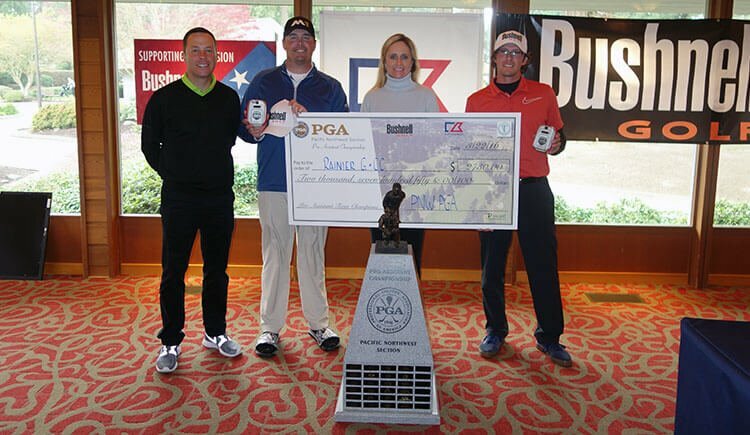 The team from Rainier G&CC (Seattle, WA), consisting of Head PGA Professional Darren Black and Assistant Professional Uriel Jimenez, fired rounds of 67-65-132 to win by one stroke. In second place were the teams from Astoria G&CC (Warrenton, OR), Broadmoor GC (Seattle, WA), and Tualatin CC (Tualatin, OR). The lone skin of the event went to the team from Broadmoor GC with Head PGA Professional Dan Hill and Assistant PGA Professional Tim Feenstra. 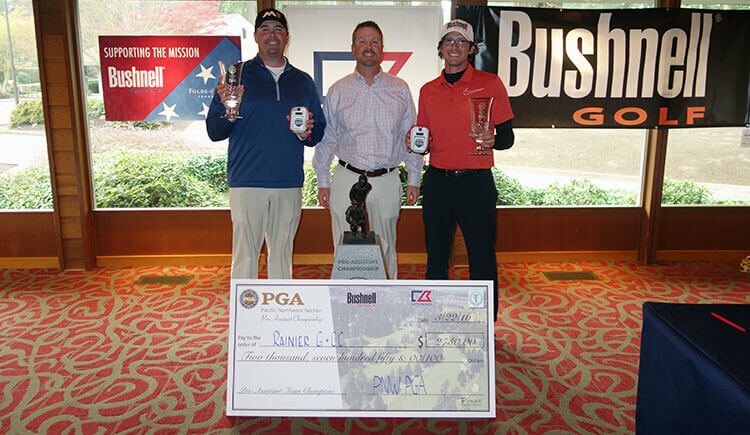 Bushnell and Cutter & Buck are returning with Representatives Sally Schmitz and Bryan Dickson as Presenting Sponsors of the Pro-Assistant Championship. PTE Golf returned as our Supporting Sponsor this year. Past team champions participating were Head PGA Professional Brent Murray and his Assistant PGA Professional Scott Erdmann of Oswego Lake CC (2012), Head PGA Professional Marti O’Neill and his Assistant PGA Professional Josh Immordino of Riverbend GC, and Head PGA Professional Mike Gove with Assistant PGA Professional Eric Berry of Inglewood GC (2003, 2004). Also expected to be in contention is host PGA Head Professional Sean Fredrickson who is playing with three of his Assistants. Pacific Northwest Professional-Assistant Championship got off to an exciting start in 1922. It took the Progress Downs team of Jerry Minor and Ralph West SEVEN holes of sudden-death to finally shake the Royal Oaks duo of Steve Bowen and Michael Wilkerson. After shooting 14-under at Tacoma Country and Golf Club, neither of the two teams could get a birdie putt to drop in the playoff. The 1995 Redwood Golf Center team of Scott Williams and Mike Barnett still holds the tournament record after scorching the rest of the field with an 18-under 126 at McCormick Woods GC and winning by three strokes. This championship has fostered camaraderie between the Head Professional and his Assistant and is one of the most popular events of the Pacific Northwest Section PGA. In 2008, Head PGA Professional Steve Prugh and his Assistant Corey Prugh made history by being the first father-son duo to capture the title which they won again last year. Tradition is the cornerstone of Tualatin CC. Since its inception in 1912, the Club has established a reputation as one of the finest country clubs in Oregon. The Golf Course is a Chandler Egan Design, defined by large Douglas fir trees, tight fairways and small greens. Tualatin CC has had the great opportunity to host some of the Pacific Northwest largest championships since its inception. Among those are: the PNW Assistant Championship in 2007, 2011, and 2015; the Hudson Cup in 2014; the PNW Senior PGA in 2008; the Northwest Open in 1986; and the Oregon Open in 1946, 1950, 1954, and 1962.